You may have been expecting another giveaway today, and there is a giveaway from BlogHer and LAND O LAKES®, but this Friday I also wanted to focus on a cause near and dear to my heart. 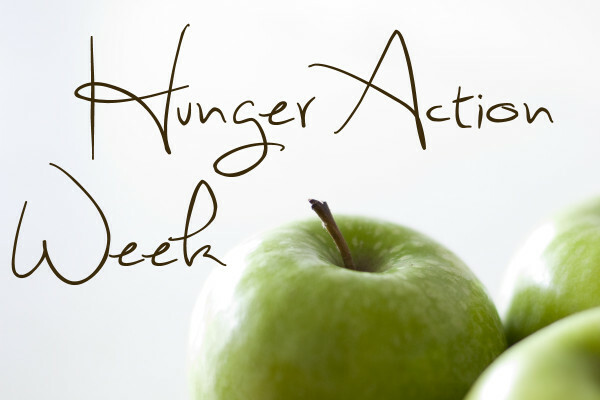 Next week will be United Way of King County’s Hunger Action Week. This is my third year participating in the Hunger Challenge and blogging about my experience, and I’ve been excitedly planning what incredibly healthy and incredibly cheap recipes to cook and share with you. This year my focus will be on bulk bins, fun ingredients like bulgar, quinoa, couscous and dried beans. Ingredients that I had no clue about at the time in my life when I needed them the most. United Way of King County is a fantastic organization that brings caring people together to give, volunteer, and take action to help people in need and solve the King County community’s toughest challenges. Their Hunger Action Week is designed to raise awareness about the hunger problem in South King County, as well as funds (97% will go directly to meeting community needs) and food donations. 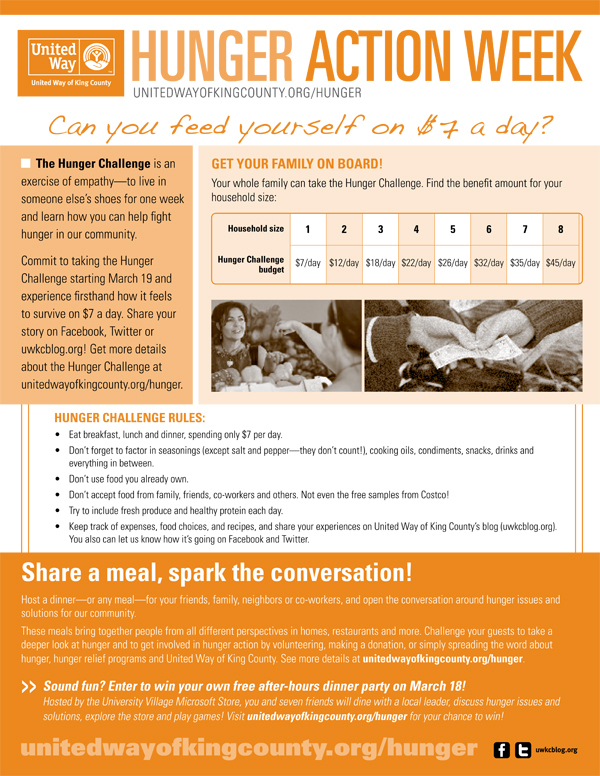 A big part of Hunger Action Week is the Hunger Challenge, an exercise of empathy designed to help you walk a week in the shoes of someone who depends on foodstamps to eat. It’s not a game, nor is it an accurate reflection of the true struggles faced by someone who experiences food insecurity. But it is a step toward understanding and a great way to raise awareness and start conversations about hunger with your family and friends. The basics of the challenge are that you live on a certain dollar amount each day based on the number of people in your family. This includes everything from spices to oils to condiments and drinks. The only things that don’t count toward your dollar amount are salt, pepper and tap water. You’re supposed to depend on this amount of money and not take free samples, food from friends, or any food but what you’ve paid for from your daily allotment. Check out the full rules below. Having not only participated in the Hunger Challenge for the past two years, but also spending over a year living off of about $10 a week for food, I have a lot of tips to share to help you succeed in the Hunger Challenge. 1. Plan your menu for the week before you shop. This is THE most important tip not only for the hunger challenge but also for food budgeting in general. Make a plan of what you want to cook and create your shopping list. Try and plan meals that use similar ingredients, especially condiments. Make your ingredient list and stick to it when you shop for the week. 3. Keep two meals a day as simple as possible. We have oatmeal for breakfast and change it up by stirring in different kinds of fruit or spices. We’ll also have an option of something else like toast or eggs or smoothies once or twice a week for when we want something different. For lunch we have sandwiches or leftovers. By keeping those meals simple, I only have to get creative with one meal a day. 4. Try not to spend it all at once. This is easier to do if you have more people in your family and get a higher allotment. It may not be possible for just one person. Two years ago I got really sick during the Hunger Challenge and felt like I couldn’t stomach anything but ginger ale, saltines and ramen. Fortunately I hadn’t spent my entire budget for the week and didn’t have to break the challenge. You never know what might come up and planning for unknown emergencies can save you a lot of stress. Plus, if you have a few dollars left toward the end of the week you might be able to get a special treat! 5. Utilize bulk bins. This is what my posts next week will be all about. Buying food in bulk is almost always cheaper. But when you’re on food stamps you can’t really afford money saving techniques like buying a half a cow. This is where bulk bins come in handy. You can buy exactly the amount you want or have the money for. Depending on the store you can get pasta, grains, dried fruit, spices, herbs, baking ingredients and rice. We’ll be talking a lot about hunger in America next week and I would love to hear your stories, either of your own struggle with hunger, people you know who have faced hunger, or what you’ve done to try and alleviate hunger for others. So make sure to come back next week, and whether you want to take the Hunger Challenge, or just be a part of raising awareness during Hunger Action Week, all you have to do is sign up!